Old E.W.E, otherwise known as Edwin Edwards, the former governor of Louisiana and convicted felon is apparently mulling a run for Congress. When asked, Edwards stated that he didn’t have any comment at this time. This is otherwise political speech for “yes, I intend to”. Until we get a final answer from former Governor Edwards, I have some thoughts on the issue. Last year the Louisiana food stamp program had an error which caused to some people to overcharge their cards for food. I will talk about how many people were punished for what the GOP calls rampant fraud and abuse. Mardi Gras is coming up next week in the City of New Orleans. Some new laws have been passed to cover some activities along the parade route. I will talk about some of those and if they are good for the city. And finally I have to talk about the Michael Dunn case. He was found guilty on most charges. I will explain why this isn’t the travesty of justice that some are claiming as well as why it also doesn’t mean that Florida is in the clear. 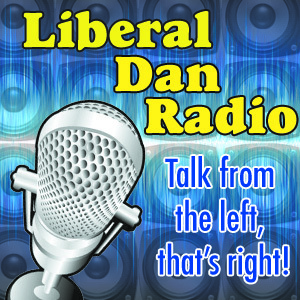 Those topics, tweet of the week, words of redneck wisdom, headlines and more tonight on Liberal Dan Radio: Talk From The Left, That’s Right. One of the biggest lies told by the Conservatives after Newtown is that shooters will focus their attempts at violence at gun free zones because they will meet no resistance. Their solution is to put armed guards at these schools to keep the potential shooters away. So why did this happen? That’s right. A gunman entered a police precinct and started shooting. So much for the theory that having guns at a location will prevent a shooter from attempting gun violence. The truth is that a potential killer will commit acts of violence regardless of the risk of someone else returning fire. Conservative share “facts” but reach wrong conclusions. I am a frequent listener to the John Osterlind show on Rush Radio 99.5 FM in New Orleans. I will also call in and set the Conservatives straight when important. This is where I have earned the nickname “Liberal Dan”. Today he was discussing certain “facts” pertaining to gun control. One set of facts was a listing of all countries in the 20th century that eliminated vast segments of its citizenry. Each of them had taken the guns away from their citizens. I am not disputing those facts. However, the conclusion Conservatives make about these facts are false. By pointing these “facts” out they try to make people believe that countries that enact strict gun control laws are trying to eliminate portions of their populations. But that is absolutely untrue. There are plenty of countries that have enacted stricter gun control laws that we have that are not trying to systematically eliminate portions of their populations. Another set of facts was that for the most part, mass shootings take place in “gun free zones”. This is true, but again misleading. The point he and others try to make is that these killers search out these gun free zones to commit their acts of violence. However, this is not true. Shooters may choose to commit gun crimes in such areas. Bombers do not care about a lack of gun free zones. Timothy McVeigh wouldn’t have been able to bring a gun into the building in OKC. That didn’t matter to him, because he chose to use a bomb instead. Osterlind tried to say that the facts prove that if a potential killer knows someone with a gun might be there, that they will not go murder people. However, what it tells me is that people who want to murder other people will find a way to murder those people based on the situation at hand. If the killer is less likely to be successful using a gun and instead will be more likely to be successful by using a bomb, the killer will use a bomb. The response by Osterlind? He suggested that bombs are harder to get so it is less likely that a killer would be able to get the job done with a bomb. Ironic, because that is exactly what an anti-gun advocate would say. I am more than willing to discuss the issue of gun regulations with people on both sides of the aisle. However, when the pro-gun folks insist on using logical fallacies to promote their agenda, it is very difficult to have an honest discussion with them.